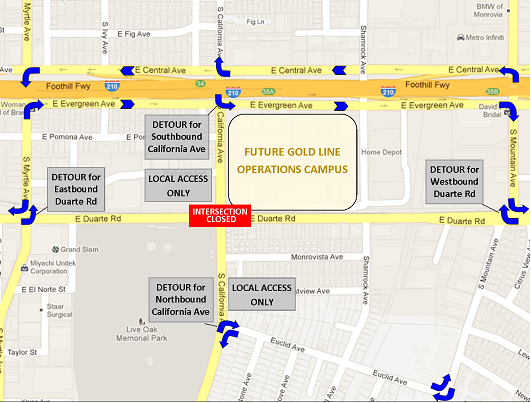 WHAT: On Monday, January 13, 2014, the intersection of California Ave and Duarte Rd will be fully closed to thru-traffic to allow crews to complete the final construction activities at this location, as part of the 11.5-mile Metro Gold Line Foothill Extension light rail project. Following this one-day closure, the grade crossing work at California Ave will be complete, and both streets will fully re-open to thru-traffic in all directions. WHEN: Monday, January 13, 2014 from 7 a.m. to 5 p.m., weather permitting. WHAT TO EXPECT: During the closure of the intersection, detour routes will be in place and signage will be posted to direct motorists. – Following the closure, California Avenue and Duarte Road will both fully re-open to thru-traffic in all directions. – Motorists are advised to expect delays. – Although no additional full closures of the intersection of California Ave and Duarte Rd are anticipated, work in the area will continue.